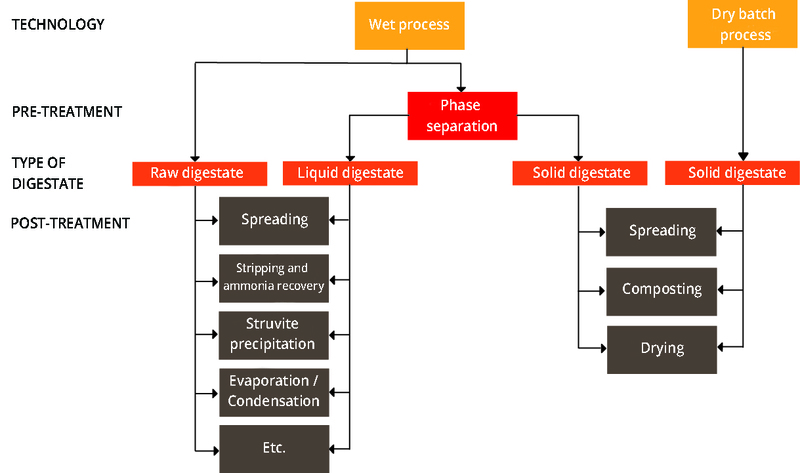 Digestate is a homogeneous and stabilized product from anaerobic digestion of organic matter. Thanks to the mineralization of fertilizing elements, digestate is a product of choice for soil nutrition. Compared to manure spreading, digestate spreading also improves microbial activity and soil respiration. Organic matter is not entirely degraded by methanogenic bacteria; it brings elements to soil fungi. Keeping organic matter at 37°C during several days removes a part of pathogens and reduces the germinative power of seeds. During anaerobic digestion, malodorous molecules are transformed. After fermentation in digester and post-digester, digestate can be spread with smells drastically reduced compared to manure spreading. Raw digestate can be separated in 2 phases, by screw press or centrifugation, to produce solid and liquid digestate. Liquid digestate from wet process is equivalent to liquid chemical fertilizer. Compared to liquid manure, liquid digestate has a better availability for plants, and is particularly rich in nitrogen for plants compared to liquid manure (especially for nitrogen). Solid digestate is equivalent to basic soil nutrition.